It's been a while, too long in fact. Living in a small village has its perks but good internet isn't one of them. A massive roll out of fibre was put in on the main road at the end of our lane, but they didn't connect any of the six houses in our post code to that fibre. Now all power goes to those on the new fibre and we get the residual power which isn't always very much. At times I can read my mail, sometimes I can answer other times the internet just fades away while I'm trying to do something. It is very frustrating as the internet is my life line to family and friends as well as fuels my research and connects me to my blog. I have found that if I get up very early, I can type and send before the internet gets busy so whenever I find I can't sleep I bundle up against the cold and come to the computer. For the past month I have been battling the flu and I'm finally able to do some work again, though I still get tired and have to rest. I'm glad I'm feeling more energetic every day but a bit sad I have missed out on some of my annual mailings. Next week we have Pancake Day (Shrove Tuesday/ Fat Tuesday), Wednesday is Valentine's Day and Friday Chinese New Year. I try to send things out for these days but being ill has made that impossible this year. I have folders for each day with clippings, patterned paper and embellishments but I'll have to save them for next year. Ideally, I should start making them now to send out for next year, but I'm definitely not that organized. I hope those of you participating in InCoWrMo and LetterMo are having fun. I didn't think I could cope with either this year so I'll take a break from them and join in next year. 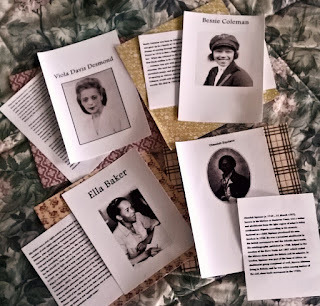 We are still in the beginning of February so I am focusing on my Black History Month postcards. I still have time to work on them without rushing so I'll put my energy there and enjoy the process rather than fussing and rushing trying to send out cards for all the holidays. The good thing about holidays is they come every year so I'll catch up with them then. For now I'll sign off and get back to work on my postcards and hope you are all enjoying your February, wherever you may be.